Tens of thousands of University of California workers are on strike today. Their message is clear: austerity and privatization are destroying education. Workers across California are on strike today. They are researchers, technical employees, health care workers, custodians, cafeteria workers, groundskeepers, security guards, and delivery-truck drivers employed by the University of California, the state’s largest employer. There are nearly forty thousand of them. 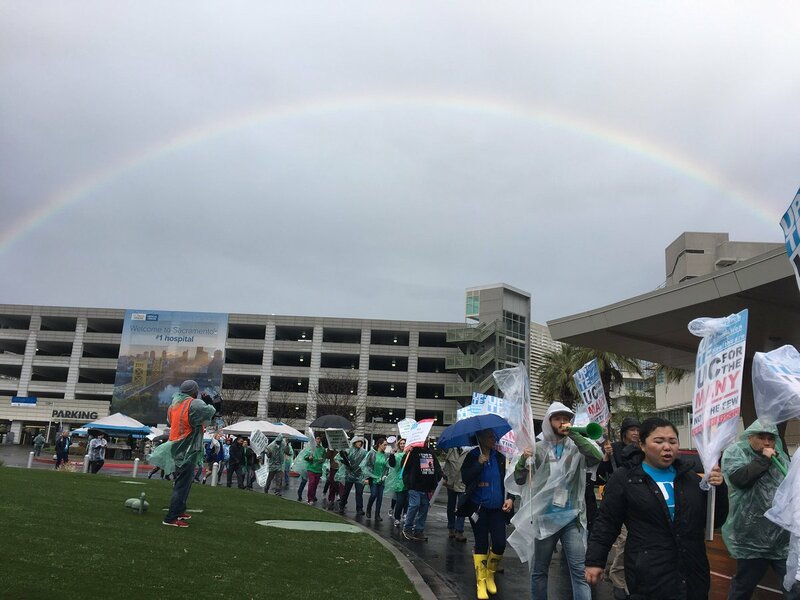 The one-day action is aimed at securing a fair contract for researchers and technical professionals represented by UPTE-CWA 9119. While the University of California continues to pay exorbitant salaries to executives and pad the ranks of upper management with well-heeled administrators, it greets workers with pension cuts, salary adjustments that are incommensurate with the cost of living, a proliferation of part-time positions, and the constant threat of outsourcing. The union’s health care workers have committed to strike in solidarity with researchers and technical workers. And joining them is the membership of AFSCME 3299, a union that represents custodians, dining service workers, and others, which has decided to go out on a sympathy strike. This powerful act of cross-union solidarity has more than doubled the size of the strike. AFSCME workers are returning the favor: last summer, when they went on strike for three days, UPTE workers joined them. Unions throughout the university system increasingly have each other’s backs, wagering that if one domino falls, the rest are sure to follow. I wish that I could tell you this afternoon that what’s going on at the University of California is kind of unique, that this is the only institution in America where an employer is not sitting down and negotiating in good faith with its union. I wish I could tell you that the University of California is the only employer in America not paying its workers a living wage. I wish I could tell you that here at the university it is unique that the entity is trying to privatize and outsource jobs. But if I told you that, it simply would not be true. Because what we are seeing all across this country is a war being waged against the working people of America. And the time is long overdue for the American people to stand up, to say enough is enough. Public university systems are a necessary battleground for organized labor, not least because they employ huge numbers of workers. Analysts at the financial news outlet 24/7 Wall Street reviewed each state’s largest employer in 2017, and found that Walmart came in first in twenty-two states. Most of the remaining states were dominated by either public university systems or health care systems, with some overlap between the two categories. Public universities are large and influential workplaces, and labor unions have a foothold in them already. But as neoliberal university administrations privatize their operations, replacing union jobs with nonunion positions to circumvent collective bargaining and cut costs, unions must fight to keep that foothold. The University of California’s largest campuses by student population are in Los Angeles and Berkeley. Both Los Angeles and the East Bay have just witnessed massive teachers’ strikes, which enjoyed unprecedented community support, and doubled as crash-courses in the labor movement’s aims and struggles for local residents. Teachers in Sacramento, which is near the system’s Davis campus, have also voted to authorize a strike. While pickets, protests, and strikes by workers in the university system haven’t gotten much attention in the past, it’s possible that residents in these cities and throughout California will take special notice this time. Hopefully more than a few will see the connections between the national teachers’ strike wave and the fightback by university workers. Both are responses to unfair working conditions that spring from same sources: austerity and privatization in public education. With this one-day strike, workers have flexed their muscles for the university. Though negotiating with an administration that systematically devalues labor and knows how to play hardball will be an uphill battle, the display of strength will no doubt boost the union’s chances of securing a fair contract. Perhaps its timing on the heels of the California teachers’ strikes will also show that the potential of the Red for Ed movement is greater than imagined. Workers in education know the pain caused by budget cuts and shady public-private partnerships, whether they work in K–12 schools or in universities, and whether or not they’re teachers. And now, workers at every level are fighting back.